חשיפה רשמית: מרצדס GLA 45 AMG - אופנתי וחזק ה מרצדס. 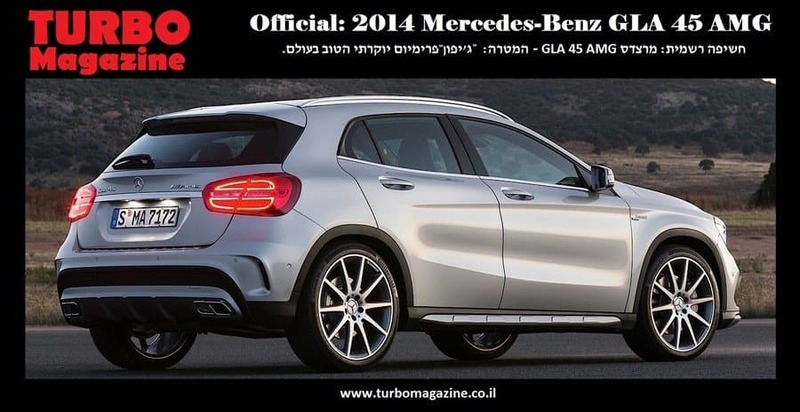 בשנת 2014 בכלל ושחקן קצה בשפיץ הפרמידה עם ה GLA 45 AMG. במחיר: 399,000 ש"ח. וכן המרצדס CLA 45 AMG שמחירו: 449,000 ש"ח. ויהפוך במהרה ללהיט היסטרי בקרב נשות צפון תל אביב. פנים הרכב זוכה לכל ה טאץ' המוכר של AMG - בדומה ל A45 AMG בסטנדרט הגבוהה ביותר. עם כונסים מגודלים. ומאחור רביעיית יציאות מפלט זוג רבועי בכל צד. בחניה של גברת פומפדור מצפון ת"א. המחיר המשוער להערכתנו בארץ 450,000 ש"ח. שיהיה להיט לקראת האביב - קיץ 2014. להציף ראשונה את מדרכות בתי הקפה האופנתים בתל אביב. 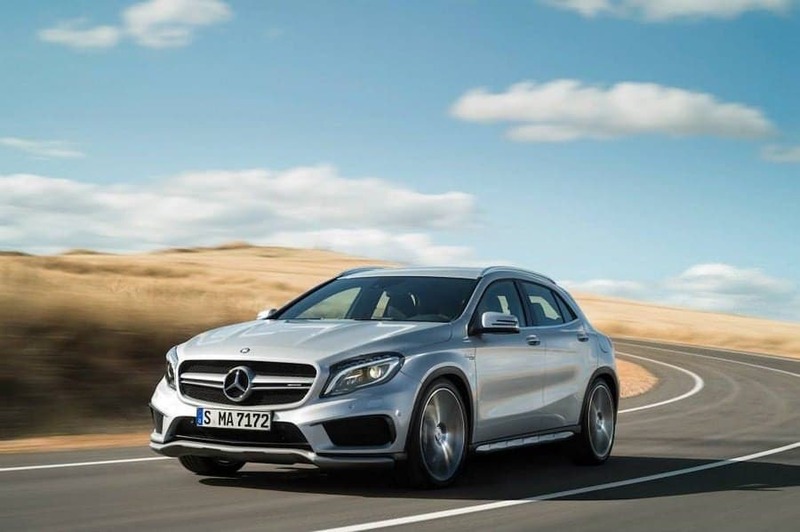 Mercedes-AMG rigorously continues its product initiative: with the new GLA 45 AMG the performance brand of Mercedes-Benz makes a dynamic statement in the strongly growing segment of the compact SUV. The combination of powerful-distinctive design, exclusive appointments as well as superior engine power and driving performance is unique: the most powerful series-production four-cylinder engine in the world puts 360 hp of power and 450 Newton metres of torque on the road. 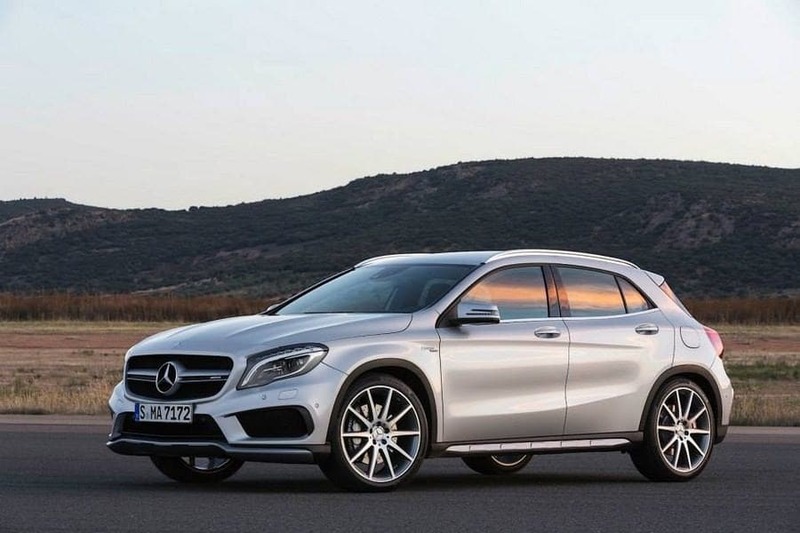 The new GLA 45 AMG high-performance SUV also shines with regard to emissions and fuel consumption figures. 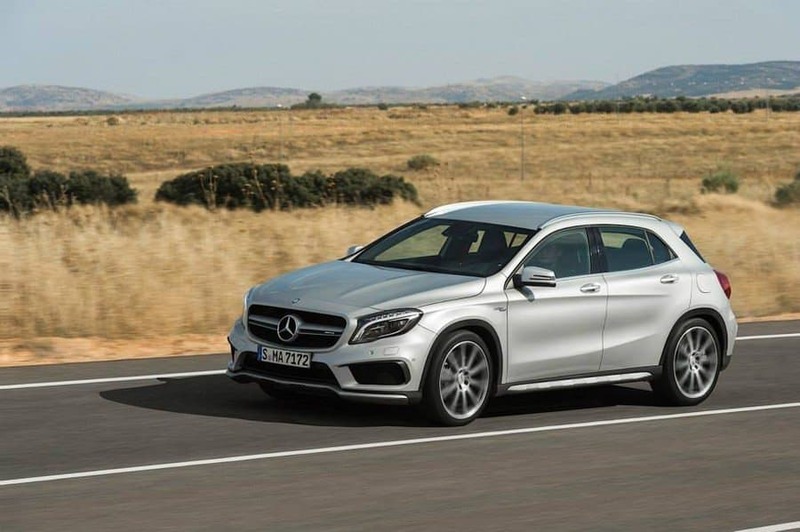 With a fuel consumption of 37.6 mpg (NEDC combined; CO2: 175 g/km) and compliance with EU 6 emissions standards the GLA 45 AMG once more provides proof that at Mercedes-AMG maximum performance does not come at the expense of environmental compatibility. 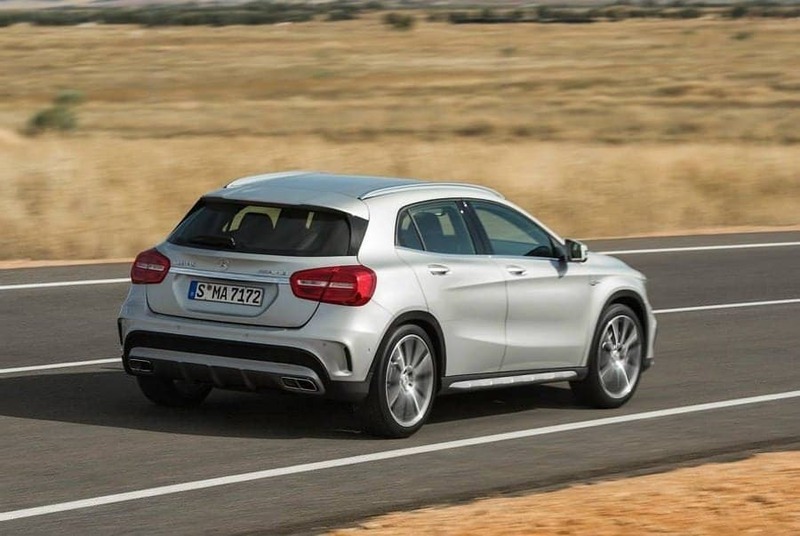 The GLA 45 AMG also holds the pole position with regard to driving dynamics: it accelerates from zero to 62 mph in 4.8 seconds and reaches a top speed of 155 mph (electronically limited). Thanks to the combination of standard-fit performance-oriented AMG 4MATIC all-wheel-drive and the AMG SPEEDSHIFT DCT 7-speed sports transmission, the GLA 45 AMG impresses with its equally sporty and efficient drive system concept. Tobias Moers, Chairman of the Board of Management of Mercedes-AMG GmbH: "The response to the Concept GLA 45 AMG during the world première at the Los Angeles International Auto Show has reaffirmed our decision to launch this new AMG model. Currently there is no segment growing faster than that of compact SUVs. For Mercedes-AMG it is therefore a logical step to make a dynamic statement in this segment with the GLA 45 AMG. Our new high-performance-SUV not only offers the world's most powerful series-production four-cylinder engine, but also impressively low fuel consumption and emissions figures. Not least on account of the performance-oriented AMG 4MATIC all-wheel drive, the GLA 45 AMG is a true AMG when it comes to driving dynamics." In addition to the A 45 AMG and CLA 45 AMG, the GLA 45 AMG is the third vehicle with the four-cylinder turbo engine to appeal to a young target group. The trend-oriented customers set great store in styling, dynamics and independence – traits that are perfectly embodied in the new high-performance SUV from Affalterbach. Meeting a wide variety of customer desires has always been one of the strengths of Mercedes-AMG. The GLA 45 AMG now expands the extensive SUV line-up to five models (GLA 45 AMG, ML 63 AMG, GL 63 AMG, G 63 AMG and G 65 AMG). Mercedes-AMG thus offers the widest range of SUVs among all high-performance premium brands. Best in class: the engine of the GLA 45 AMG fully lives up to this claim, as a look at the figures shows. 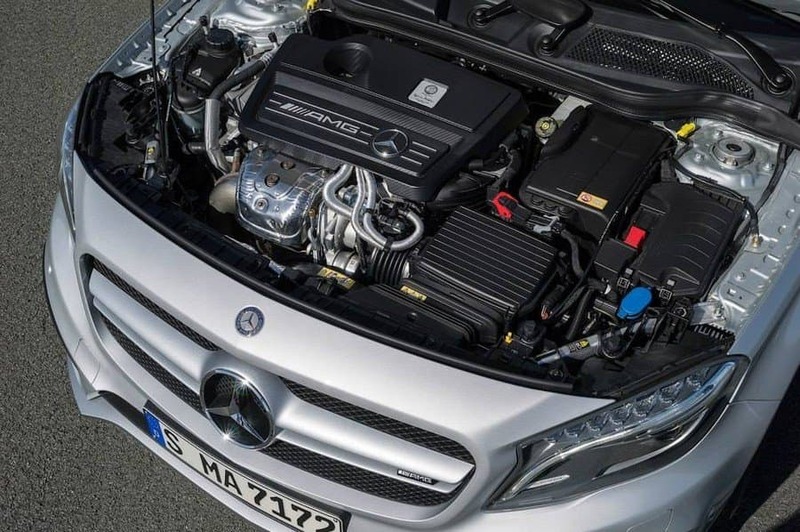 The AMG 2.0-litre turbo engine is the most powerful series-production four-cylinder turbo engine in the world. It produces 360 hp of power and develops a peak torque of 450 Newton metres. A power density of 181 hp puts the AMG high-performance turbo engine on a par with the world's most powerful super sports cars. Development of the high-performance turbo engine, which is part of the BlueDIRECT family, placed emphasis on a sustainable reduction in particulate emissions. Consequently the GLA 45 AMG today already complies with the second stage of the EU 6 emissions standards coming into effect in 2017. The AMG 2.0-litre four-cylinder turbo engine features spray-guided direct petrol injection with piezo injectors positioned centrally in the four combustion chambers and an injection pressure of 200 bar. The combination of multiple fuel injection and multiple spark ignition improves fuel economy and significantly increases the thermodynamic efficiency, leading to low exhaust emissions. The injection system's outstanding flexibility also ensures a high degree of freedom in terms of application. There are up to five injections per combustion cycle in the cold-start and warm-up phase, which is so crucial for emissions. One of the key factors for in-engine particulate reduction is a reduction of the individual injection quantities. Mercedes-AMG addresses the basic challenge with regard to the throttle response of a small-capacity turbo engine by using a twin-scroll turbocharger, maximum dethrottling of the exhaust system and an innovative injection strategy. Twin-scroll technology provides for a more spontaneous build-up of charge pressure: utilisation of the exhaust back-pressure, exhaust-gas temperature and exhaust-gas pulse has a positive impact. This results in a faster build-up of torque at low engine speeds. A positive side-effect: fuel consumption and exhaust emissions also benefit from twin-scroll technology. With a maximum charge pressure of 1.8 bar, the AMG 2.0-litre four-cylinder turbo engine leads the field on this front, too. The AMG sports exhaust system in the GLA 45 AMG features large pipe cross-sections and an automatically controlled exhaust flap: this technology reconciles the two conflicting goals of a dynamic driving experience and hallmark Mercedes suitability for long-distance driving. The flap in the rear silencer is continuously adjusted under map control according to the driver's performance needs, load condition and engine speed. The two rectangular chrome-plated twin tailpipes on the AMG sports exhaust system emit a distinctive exhaust note, which is particularly impressive during powerful acceleration. An AMG Performance exhaust system, also equipped with an exhaust flap, is available as an optional extra. Customers opting for this system will experience an even more appealing and distinctive engine sound. The AMG 2.0-litre four-cylinder turbo engine is assembled purely by hand in accordance with the traditional AMG philosophy of "one man, one engine". Apart from serving as an AMG hallmark confirming superlative production quality, the AMG engine badge bearing the engine fitter's signature also attests the peerless DNA of Mercedes-Benz's high-performance brand. The AMG SPEEDSHIFT DCT 7-speed sports transmission in the GLA 45 AMG features three distinct transmission modes, a double-declutching function dependent on the transmission mode and a RACE START function for optimum acceleration. The strengths of the dual-clutch transmission include spontaneous gear shifts without loss of tractive power, a tailor-made control strategy based on the AMG SPEEDSHIFT functions, extremely smooth gear shifts, and a high level of efficiency. The shift times in manual mode "M" and in sport mode "S" are similarly sporty in character to those of the SLS AMG GT super sports car. Quick and precise retardation of the ignition and suppressing injection under full load lead to even faster gear shifts in "M" and "S" modes, with a more thrilling sound. The transmission control fully utilises the benefits of the direct injection technology right up to the physical limits: the quicker engine response ensures that injection is suppressed with even more precision. The effect: the shift speed and an emotional sound experience are optimised. Another special feature designed to enhance dynamic performance and driving pleasure is the so-called "Momentary M mode" – as seen in the SLS AMG Coupé Black Series super sports car. In "C" mode (Controlled Efficiency), smooth transmission and engine characteristics support a fuel-efficient and comfort-oriented driving style. In addition, the ECO start/stop function is active in "C" mode. 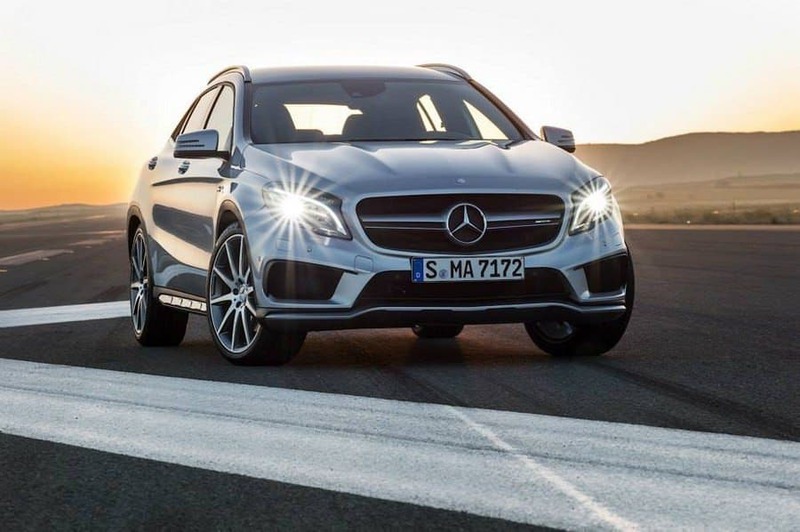 The GLA 45 AMG comes with variable AMG 4MATIC all-wheel drive as standard. In developing this all-wheel-drive system, the focus was firmly on performance and dynamic spirit. The all-wheel-drive system transfers the engine power to the road optimally and provides perfect traction – regardless of the weather conditions. It also elevates driving dynamics to the highest level. The entire drive unit boasts a weight-saving and compact design: the power take-off unit (PTU) is fully integrated into the 7-speed sports transmission and handles the power transfer to the rear drivetrain. A two-part propeller shaft sends the power of the engine to the rear axle as well. In the interests of favourable weight distribution, an electro-hydraulically controlled multiple-disc clutch is integral with the rear-axle differential. The multiple-disc clutch control detects slip at the front axle. A hydraulic pump instantaneously presses the discs together and channels the engine torque to the rear wheels as necessary. All this takes place without the driver noticing. Power distribution is fully variable: during normal driving the GLA 45 AMG uses front-wheel drive for optimal efficiency. When required by the driving situation, the variable all-wheel-drive system splits the torque between the front and rear axles up to a ratio of 50:50 percent. Typically for AMG, the Electronic Stability Programme is configured as a three-stage ESP®. The GLA 45 AMG comes with three transmission modes: "ESP ON", "SPORT Handling Mode" and "ESP OFF" – enabling the driver to vary dynamic performance according to individual requirements at the push of a button. ESP® Curve Dynamic Assist is likewise included as standard. During dynamic cornering, imperceptible braking intervention on the rear inside wheel creates a defined yaw moment about the vertical axis. 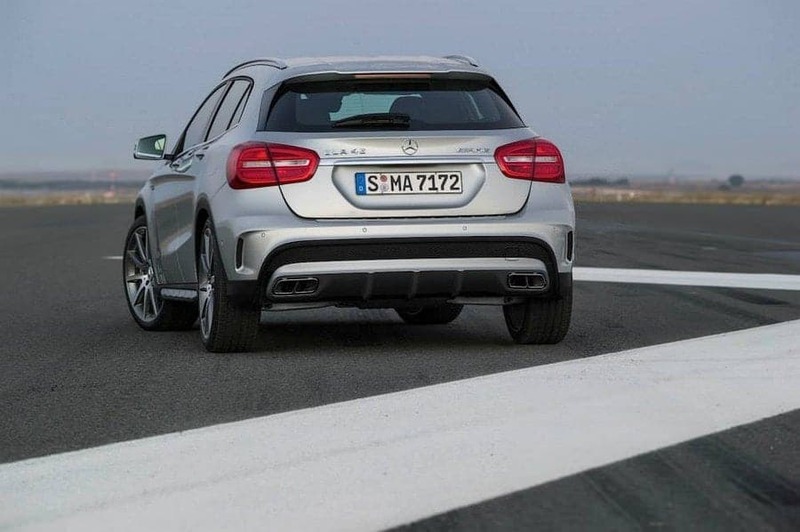 The effect: the GLA 45 AMG turns in precisely and controllably at all times while unwelcome understeer is prevented. One of the keys to agile handling is the axle technology: for enhanced driving dynamics, the MacPherson front axle on the GLA 45 AMG is fitted with stiffer steering knuckles and new elastokinematics. The four-link rear axle has also been newly developed. Stability and precision of handling are enhanced by the optimised elastokinematics and the rigid connection between the subframe and the body. The AMG sports suspension with specially tuned spring/damper units and bigger anti-roll bars provides for high lateral acceleration and reduced body roll in fast double bends. An AMG performance suspension with firmer spring and damper tuning is available as an optional extra. The AMG speed-sensitive sports steering with specific, speed-dependent power assist ensures high steering precision and agility. The AMG high-performance braking system with vented, cross-drilled brake discs all-round and grey-painted brake callipers provides for spontaneous and reliable deceleration. Red brake callipers are available as an optional extra. In standard specification the GLA 45 AMG runs on five-twin-spoke AMG light-alloy wheels painted titanium grey with high-sheen finish, mounted with tyres of size 235/45 R 19. As an optional extra from the AMG Performance Studio, customers can opt for larger 10-spoke AMG light-alloy wheels with tyres of size 235/40 R 20 – these are available painted titanium grey with high-sheen finish or painted matte black with high-sheen rim flange. The design of the GLA 45 AMG exudes style on account of its powerful and distinctive character. As the powerful AMG top-of-the-line model of the GLA class, the high-performance SUV combines the hallmark sensual clarity of Mercedes-Benz as an expression of modern luxury with muscular elements exclusive to AMG. The AMG front apron with front splitter and the AMG "twin blade" radiator grille provide athletic highlights – both are painted matte titanium grey. Completely new: the distinctive AMG lettering at the side between the louvres of the radiator grille. This will make all new AMG models easy to recognise in future. Black flics (air deflector elements) above the large cooling air intakes at the sides are indicative of motor sport. Bi-xenon headlamps come as standard. When viewed from the side, the distinctive AMG light-alloy wheels in three design variants catch the eye. The side sill panels with matte titanium grey inserts, the "TURBO AMG" lettering on the front wings and the aluminium roof rails lend the GLA 45 AMG a special touch. The rear end is dominated by the diffuser insert with matte titanium grey trim and by the rectangular, chrome-plated tailpipe trim of the twin tailpipes of the AMG sports exhaust system with exhaust flap. As in all AMG high-performance automobiles, the interior of the GLA 45 AMG delights with its high-quality appeal, combined with sporty flair and exclusive equipment features. Sports seats in Artico man-made leather/Dinamica microfibre with red contrasting topstitching and red designo safety belts are just as much at home as the AMG DRIVE UNIT. The three-spoke nappa leather multifunction sports steering wheel with red contrasting topstitching, perforated leather in the grip area and steering-wheel shift paddles allows for perfect vehicle control. The AMG instrument cluster with two-tube design and central colour display, AMG main menu and RACETIMER is on hand to provide information to the driver. On opening the door, the driver is greeted by the AMG start-up screen. The trim of the instrument panel is of brushed aluminium and, in tandem with the brushed stainless-steel AMG front door sills, emphasises the high-grade, exclusive ambiance inside the GLA 45 AMG.